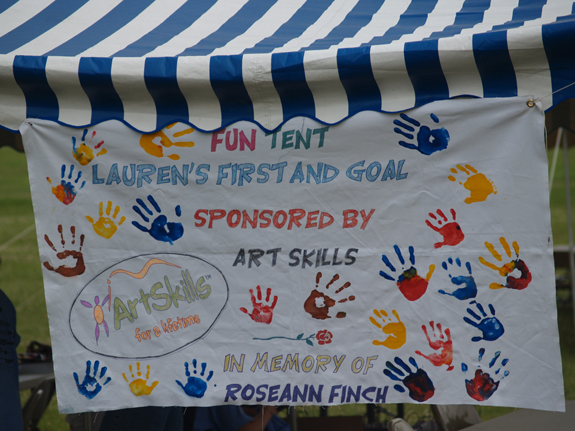 The Fun Tent is an informal crafts and activity area that is offered during the afternoon of the LFG Football Camp in PA. It is open to all of the pediatric cancer survivors, families and friends from our local clinic as well as to the children of volunteers, coaches and younger siblings of the players who are participating. Activities and crafts are appropriate for children up to age 12. The afternoon features an array of arts and crafts activities, a visit with the Lehigh Valley Therapy Dogs and handlers and a special guest appearance by the Lafayette Leopard. The Fun Tent includes food, drinks and gifts to take home. See more details about this year's event in the PDF below. 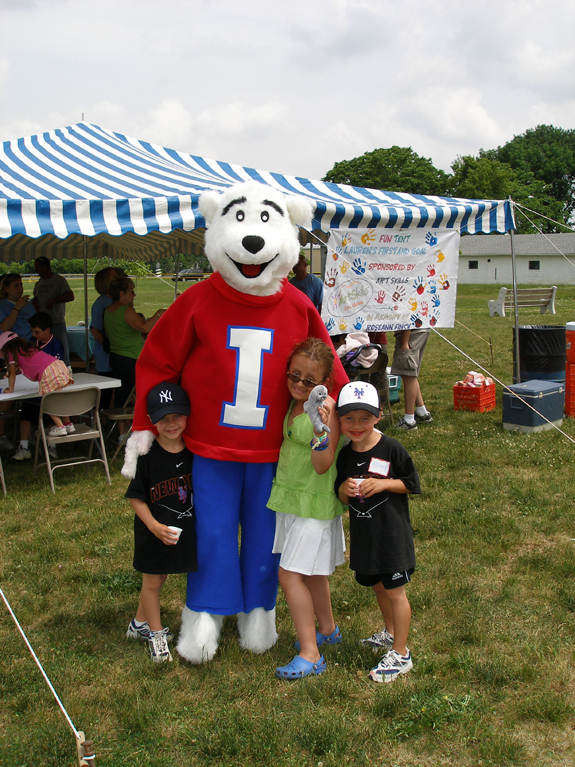 Previous activities at the Fun Tent have included costume character visits, volunteer artists from Splashes of Hope, treats from the Angel 34 ICEE Van, and former NFL quarterback Phil Simms signing autographs and spending time with the children. Please RSVP to mloose@lfgf.org at least 1 week prior to the camp date with the name and age of the child participating. 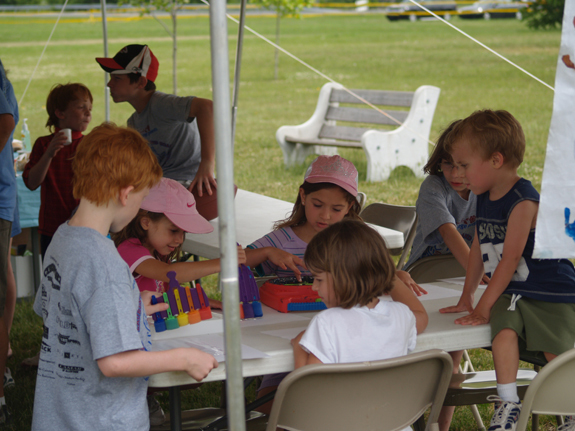 Arts and crafts are one of the many activites for children at the LFG Football Camp Fun Tent. Children enjoy a variety of entertainment and activites at the LFG Football Camp Fun Tent. The ICEE bear has accompanied the Angel 34 ICEE van to previous LFG Football Camps. 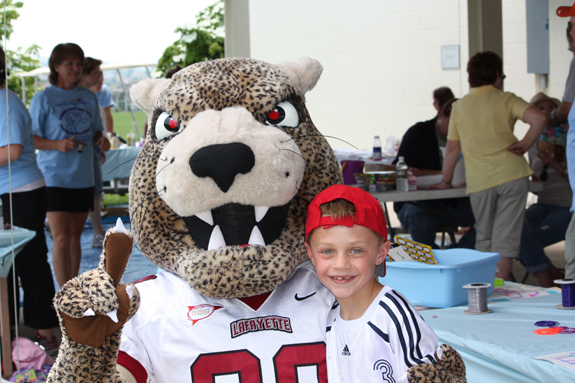 The Lafayette College Leopard has made guest appearances at the Fun Tent in past years. This sign marked the 2007 LFG Football Camp Fun Tent. Lehigh Valley Therapy Dogs bring smiles to kids at the Fun Tent.